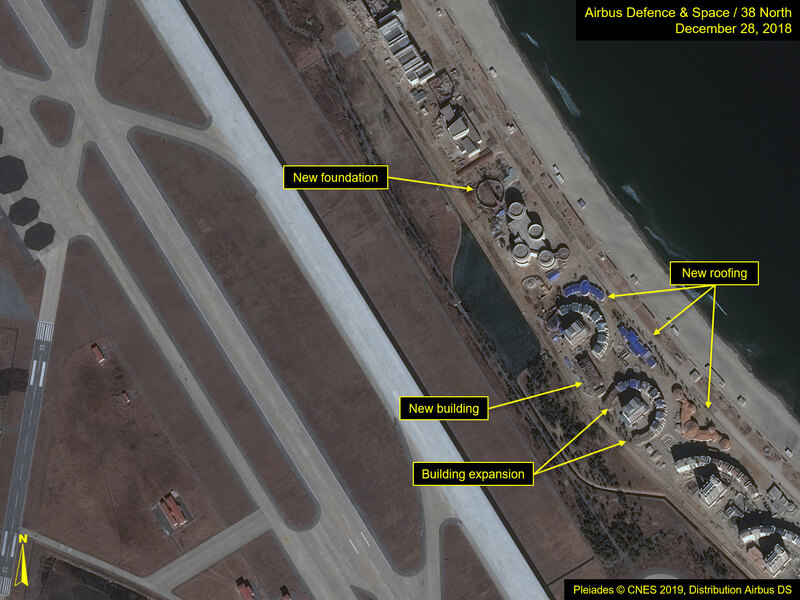 In Kim Jong Un’s 2019 New Year’s address, he emphasized the importance of economic development and listed a few of his priority projects, including the Wonsan-Kalma Tourist Zone. 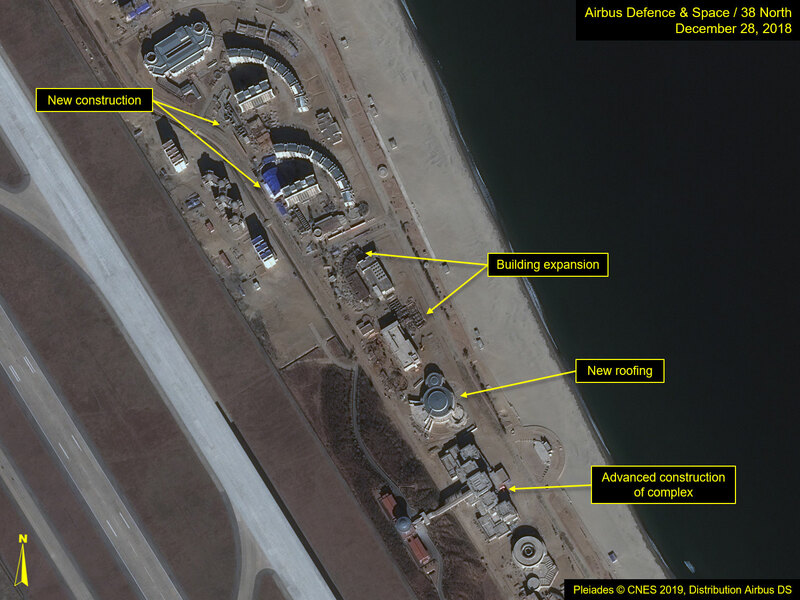 While Kim may have been somewhat critical of this project’s status when he visited the zone last October, significant progress has been made in the past two years to prepare for an October 2019 opening. 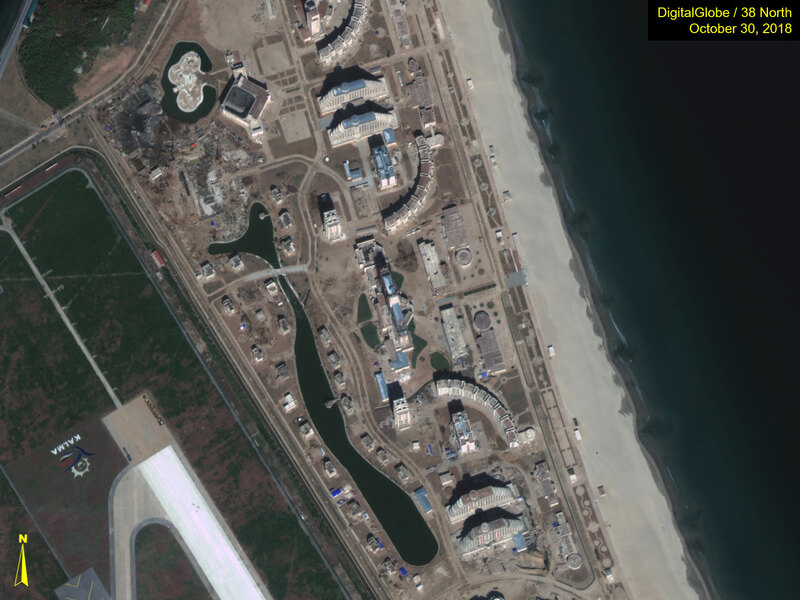 Commercial satellite imagery shows that the resort was only a few buildings near the Wonsan-Kalma airport in July 2017 but had grown into a vast beachfront complex in just over a year. 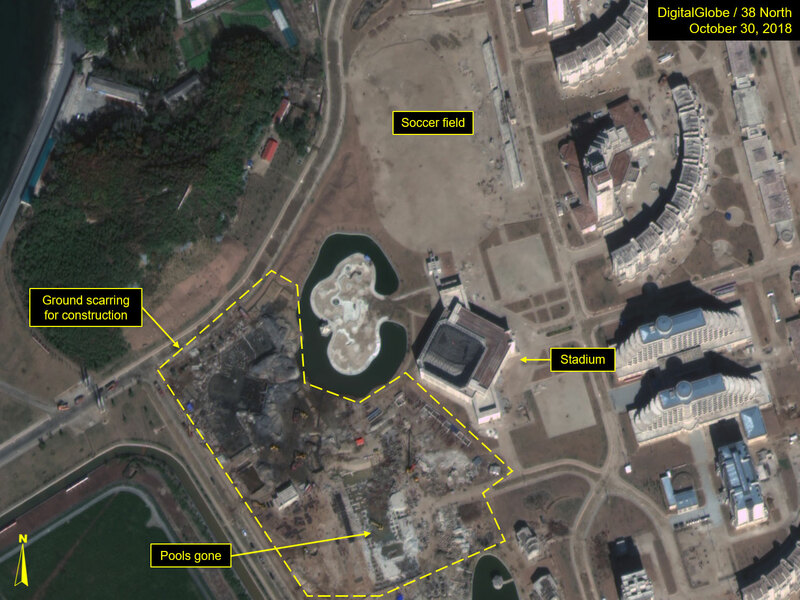 Kim’s reported “disappointment” of the project—criticizing the design and layout of the resort, and calling for more amenities, such as game arcades, theaters and a funfair—follows in line with his more critical demeanor during his site visits since last summer. After Kim’s October site visit, the pace of construction remained high and by December, the majority of buildings that had been under construction nearing external completion and several new or redesigned buildings were in advanced stages of construction. There were significant efforts to landscape and beautify the resort grounds as well. Developing a tourism industry in North Korea has been a focus of the government for several years, with a special push since around 2011 to ease the bureaucratic process for admitting Chinese tourists, increase international flights, improve infrastructure, and build or refurbish hotels in scenic areas. 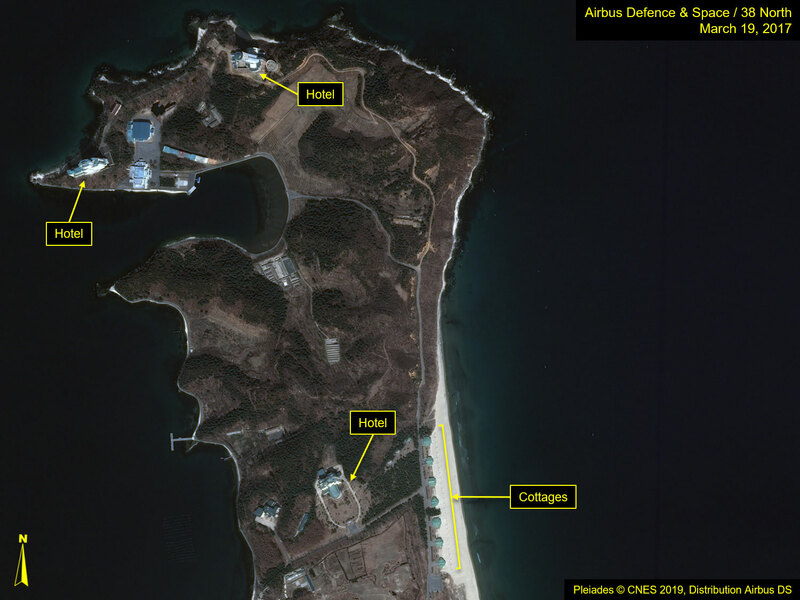 However, the enormous investment of time and resources being put into the development of the Wonsan-Kalma Tourist Zone likely underscores a desire to demonstrate that North Korea, despite the economic sanctions in place, has an economy that is moving forward and showing signs of prosperity. It may also reflect an expectation that as the country improves its external political relations, tourism will follow. 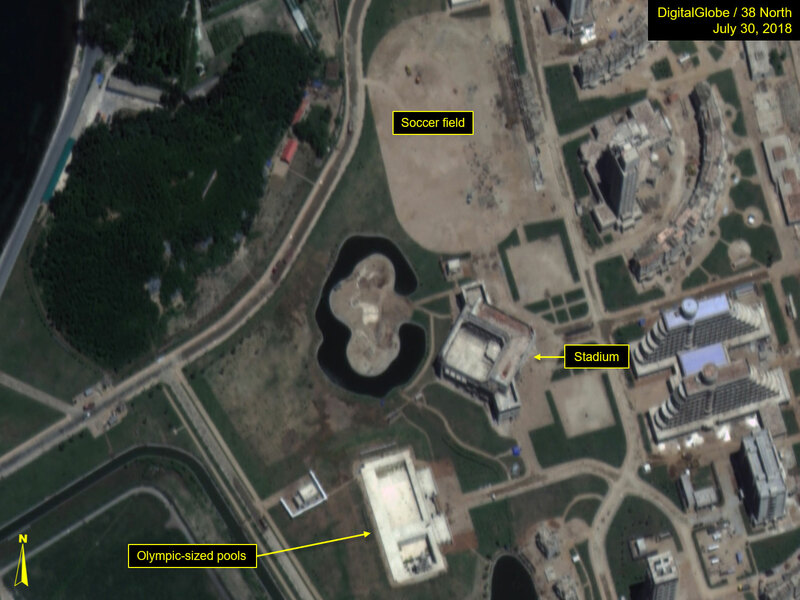 In 2013, North Korea announced that Wonsan would become the country’s summer destination for vacationers, complete with world-class resort amenities and entertainment. Located on the southeast coast of North Korea, Wonsan-Kalma is where Kim Jong Un had spent his childhood summers. He apparently holds a special fondness for the area, and thus the emphasis he has placed on turning the area into a world-class beach tourist zone. 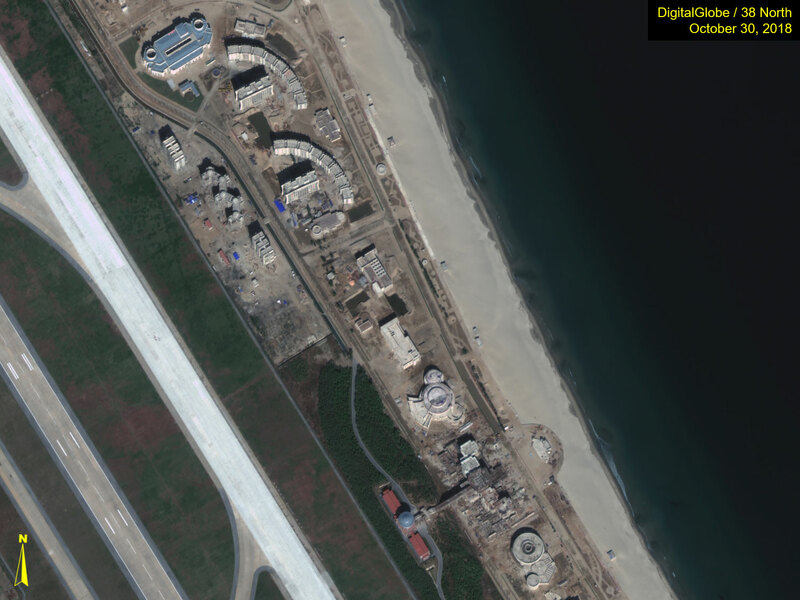 The Wonsan beach resort is located adjacent to the dual-use Kalma International Airport. This airport was originally for military purposes, but was renovated starting in 2013 and a new international terminal opened in 2015. 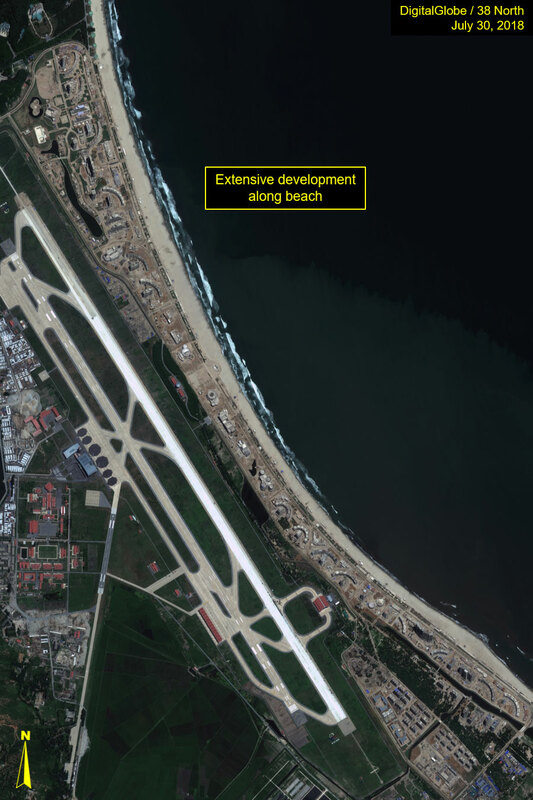 The Wonsan-Kalma region has, in addition to its beaches, a nearby lake and ski resort, the latter opening in 2016 and, reportedly, is a source of national pride. 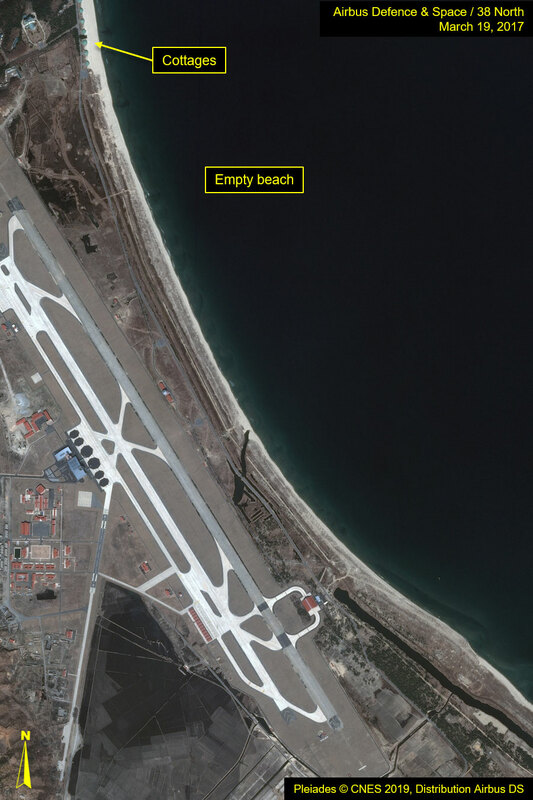 As late as March 2017, commercial satellite imagery of the area revealed little in the way of progress toward building a large-scale beach resort. 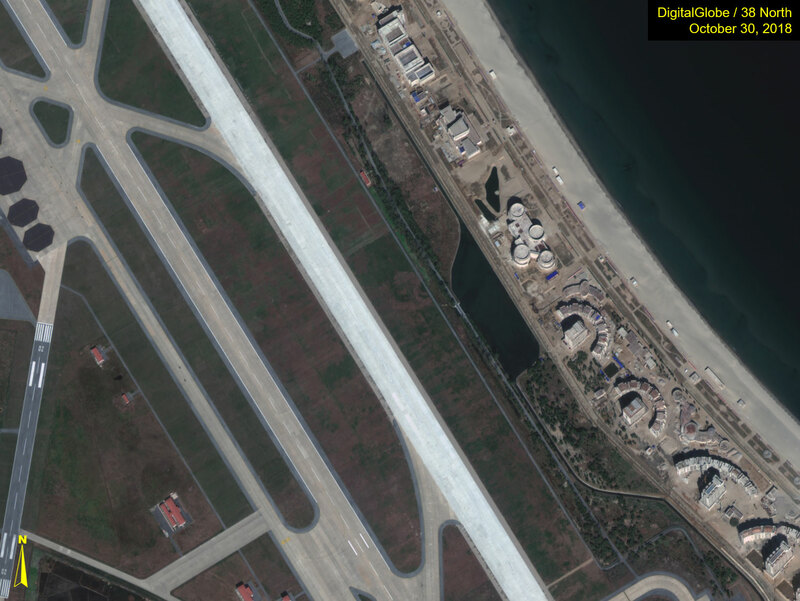 Only a few resort-type buildings can be seen just north of the Kalma Airfield. These included a couple of high-rise hotel or condo buildings, what appears to be a large mansion or hotel structure, and a series of seven cottages located on the beach. Moving south along the beach, beyond the string of cottages, the beach is barren, save for hundreds of revetments arrayed along its length, paralleling the entire east side of the airfield. These are a probable recent remnant from the “largest ever” artillery drills which were staged in early 2017. Figure 1. Few resort facilities existed in March 2017. By July 2018, a massive construction project on the Kalma beachfront was underway, with more than 100 buildings under construction, presumably an assortment of hotels, condos and other resort facilities, including at least 40 multi-story structures. Figure 2. 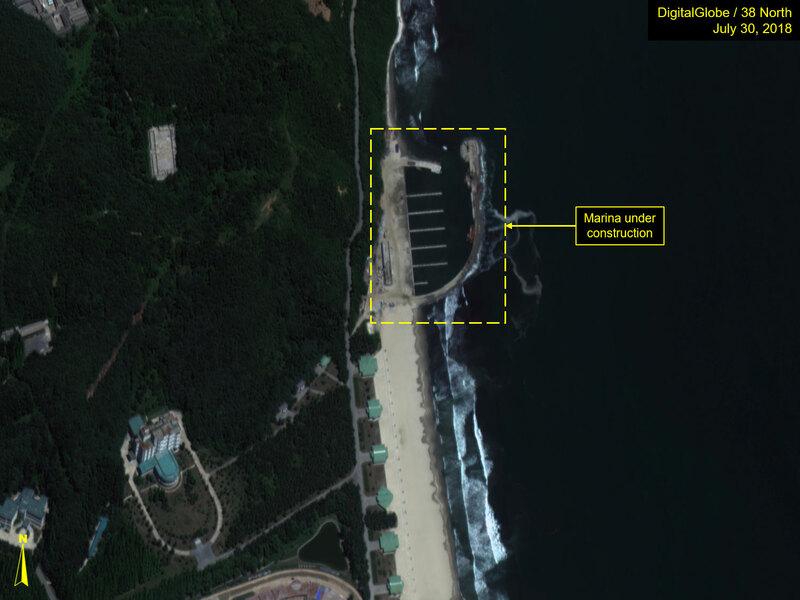 Significant progress made to develop a massive beachfront resort in just over a year. Just north of the beach cottages, construction of a new marina for pleasure craft was underway by July 2018, and complete by December. It is comprised of six finger piers and a quay, all protected by a jetty. A probable boathouse is also under construction. Figure 3. A new marina for pleasure craft. Several entertainment facilities are being constructed at the beach resort. 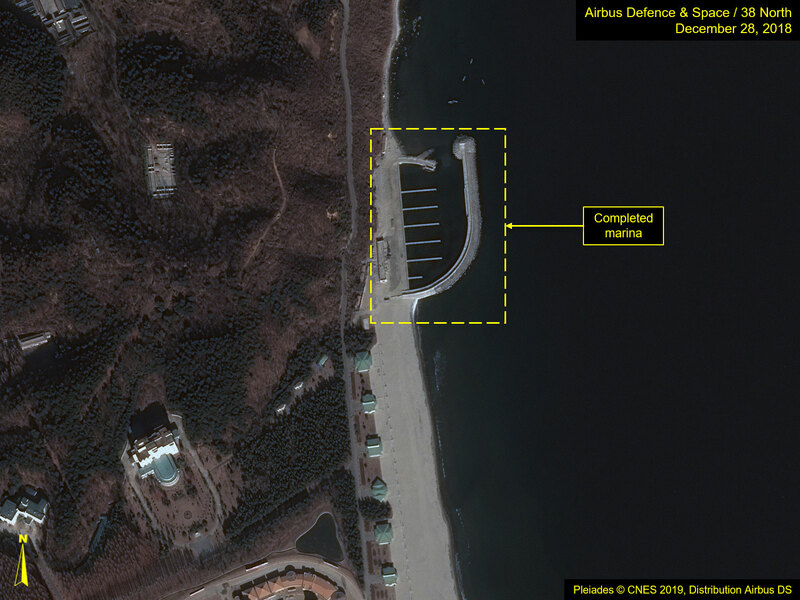 In July 2018, a sports complex had been built at the north end of the resort that included a probable soccer field (under construction), a small stadium/indoor-outdoor theater, and Olympic-size lane and dive pools. However, by October, the pool complex had been removed, and new ground scarring is visible in its place. Figure 4. The composition of a sports complex evolves as the resort is built up. 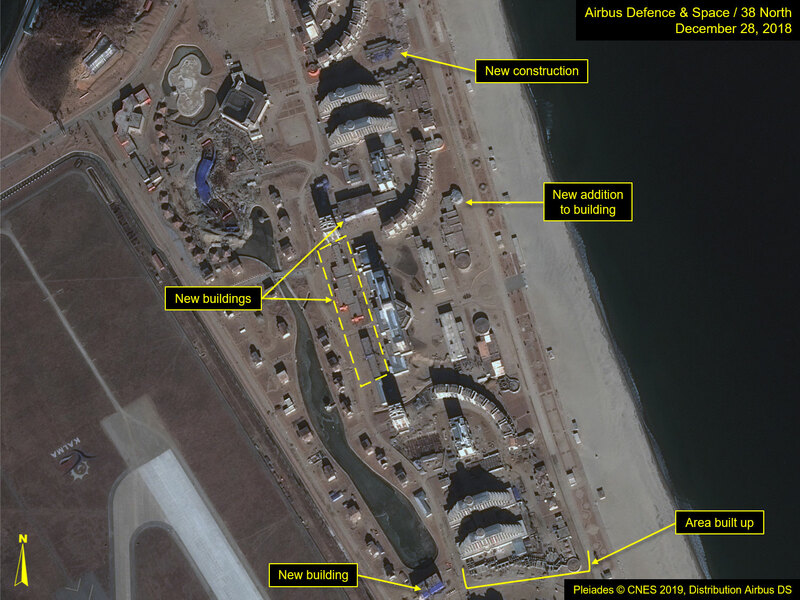 By the time Kim Jong Un visited the Wonsan complex in October, several of the buildings seemed to be nearing external completion, and new buildings were in advanced stages of construction, filling out the beach resort. After his site visit, the pace of construction remained high and by the end of December, several buildings were nearing completion, some had already been redesigned, and efforts to landscape and beautify the resort with formal gardens and beach-side parks were underway. Additionally, new buildings continue to pop up. Figures 5-7. 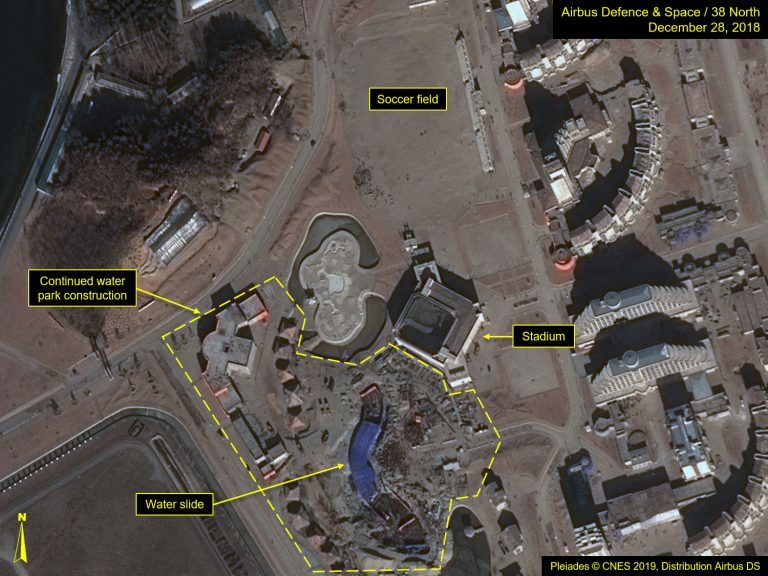 Close-ups of progress made after Kim Jong Un’s site visit in October. At the sports complex, the swim and dive pools have been replaced with an apparent water slide in the late stages of construction. 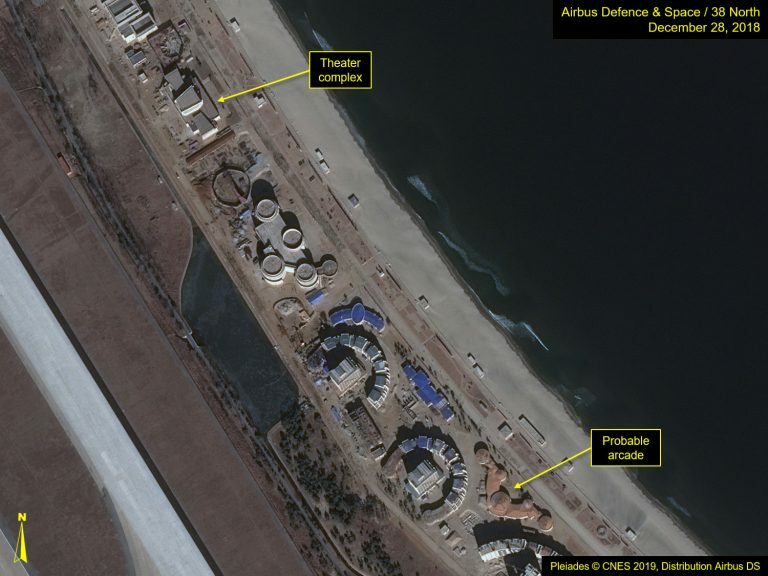 There is also a movie theater complex and several probable arcade facilities throughout the beach resort. Figure 8. Entertainment facilities peppered throughout the beach resort. Note: Hover over slideshow and click on left/right arrows to navigate. “Supreme Leader Kim Jong Un Inspects Construction Site of Wonsan-Kalma Coastal Tourist Area Again,” KCNA, November 1, 2018.